For the past couple of years my goals have been fitness related. I think I’ve done pretty well in that area, I’m at my goal weight, I’m running 5kms without stopping now. I am pretty happy with that. I’ve just bought a new piece of fitness equipment to do some toning which is what I need now, along with core strength. So this year my fitness plan = keep going on the current path. Inspired by No Buy July, I had a thought kicking around in my skull brain about trying a year of buying nothing. YOBN for short, and that is how these posts will be tagged for 2018. Realistically this is quite impossible, because one has to eat and get clean and live life, so groceries and toiletries and necessities are something most of us need to buy. When I say year of buying nothing, I mean things like clothes, shoes, homewares, that kind of stuff. There may be times when I do NEED something. After a couple of solid months of running in 2017, all my sports bras which were initially clipping on the first set of closures are now on the last set of closures and I expect that after another couple of months I will need to go and have a new bra fitting. I will happily buy these when required and I will not skimp in this area. The Other Half and I have had a quick chat about the rules. We’re not going to be super militant about this, the plan really is to make us think before we get out the $$$ and hand it over. We need to take some time and ask ourselves questions. Do we need this, or do we just want it? How is this item going to improve our lives? For some years now we’ve had a “bargain” rule in place – if we were out somewhere by ourselves and found something that we felt was a bargain, we could buy it and the other one would be ok with it. Many times in the early years of the bargain rule if it were me, I would take a photo and send it by our free messenger program (Kakao talk) and ask if The Other Half agreed with my buying it, but as time went on I tended to go with a modified version of the Nike rule of “just buy it”. I feel like we’ve got everything we want or need, at least for a while. So it is time for us to focus on enjoying the things we have and not buying more things. 1. If we both agree that we NEED something, we will buy it. This will be good for us to separate “want” from “need”. 2. Items purchased from Aldi, Coles and Woolworths will not count as these are mostly groceries and toiletries. 3. Items from Aldi special buys WILL count if they are not groceries or toiletries. 4. Items which are not groceries or toiletries will be documented and posted on the blog once a month to keep track of any “shopping incidents” that occur. I will reserve the right to add extra rules as we go, if we need them! At the end of each month I will post an update here on the blog. I may do a “what I would have bought” from time to time or I may just add that into the update post. I look forward to hearing about your ‘shopping incidents’. I’m looking forward to reading about your year of buying nothing. I don’t think I could get through a year of buying nothing, unless underwear and socks don’t count? 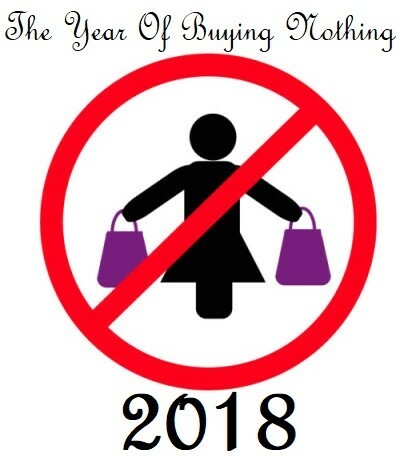 I did a 40 day fast from shopping as a New Year’s Resolution some years back … that was really hard (which I blogged about here: https://www.middleagedmama.com.au/40-days-without-shopping/ … don’t think I could manage a whole year, but good on you for trying! Looking forward to seeing how you go. I am thinking as a part of the challenge maybe I will budget for a few of the clothes I love that no longer fit me to be altered rather than spend money on new clothes this year. Perhaps one thing each month. My most favourite one size fits all dress got damaged, so I could get that fixed first. This sounds interesting! I’m doing something similar as part of my challenges this year although not being quite so hard and fast about it. The rule about “need” and “want” being two different things rang a bell with me though, as did your comment about sports bras – my previous one is far from as supportive as I require now and I actually purchased two new ones today – discounted price to start with and on a buy one get one half price offer!